ahh i can finally scripts now ! You will change the link everybuild on here? Can you put something there to know what REV is? I'll update each time there are changes, rev can be show ingame typing .show serv.build, but i'll do that anyway. Updated to [build 2437 / GIT hash 012ce90], changed the link to a .rar providing revisions, *.ini files and .dic like a regular nightly download. Fixed: Food items not restoring char FOOD correctly. Fixed: HitLeech[Life/Mana/Stam] and HitManaDrain properties making hits/mana/stam rise over the max char limit. [sphere_spells.scp]: Removed SOUND / EFFECT_ID from Teleport spell. 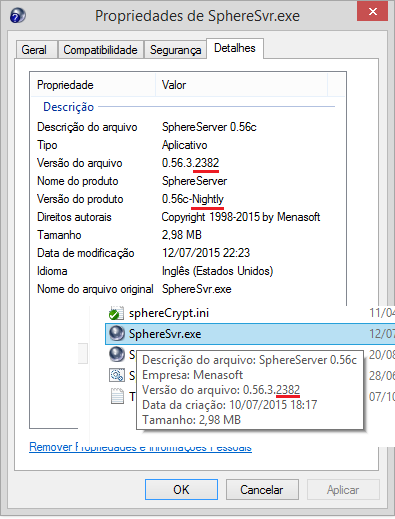 These values are already handled by Sphere.ini settings, and sphere_spells.scp values was making it play twice. Added: New STEPSTEALTH char property to set how many steps the char can walk invisible while using Stealth skill. This property is set when using Stealth skill, will decrease -1 on each walk step (or -2 if running) and will reveal when reach 0. Changed: Trigger @StepStealth no longer use ARGN1 to force reveal, the ARGN1=1 can be replaced by STEPSTEALTH=0. Fixed: Missing buff icon when using INVIS (GM command). [sphere_skills.scp]: New Stealth softcoded skill. -IMPORTANT: It's HIGHLY recommended update it, or this skill will stop working. - Updated SpawnItem to point directly to the spawn instead of redirecting to memory's link. - Moved SpawnItem (R) to COjbBase to affect both chars and items. - Spawned OBJs are now stored in the spawn, so SpawnItem only gives quick access to the spawn. - COUNT (R): Returns the total count of spawned items or chars. - RESET (W): Removes every spawned Item/Char. - STOP (W): Removes every spawned Item/Char and stops the Spawn. - START (W): Same as DClicking the Spawn, but from function, without LOS/Distance/etc limitations (It just makes it start, doesn't reset it, so won't work if it's already working). - DELOBJ uid (W): The opossite of ADDOBJ, removes one OBJ from this list (just remove from the list, it's not removing the OBJ itself). NOTE: While updating for this build, when server is loading for first time and converting MEMORY_ISPAWNED to SpawnItem and removing these memories, Sphere will throw a memory_leak exception after loading the world because of the difference between items before loading (chars with memory_ispawned) and items after loading (memory_ispawned removed).